The shuttlecock is an astonishing little flying object. An it`s the centre of attraction in the beautiful sport of Badminton. Who would have thougth, that 16 feathers stuck into a small piece of cork would make for such a fast and aerodynamic flying ball. Next to the racket the so called Badminton birdie is the most important piece of equipment. It usually has a weight of roundabout 5g and consists of 16 overlapping feathers with a length of 70mm stuck into a piece of cork. There are several variants of a shuttlecock available. Of course there are multiple colours to choose from, there are different brands. The birdies differ in qualitiy, durability, shuttle speed etc. – but the most important distinction is: Goose feather shuttlecock or Plastic shuttlecock (Nylon shuttlecock). What kind of shuttle you should use, depends on your level of play, how often you put up your badminton racket and your liquidity as well. Since goose feather shuttles have much better flying qualities but are far less durable than synthetic shuttles, I would suggest the following as a guideline: As a beginner you can use plastic shuttles to get into the sport. If you make some progress and develope your technique, you should change to feather shuttles. As an intermediate or advances player there is only one option: Goose feather shuttles! 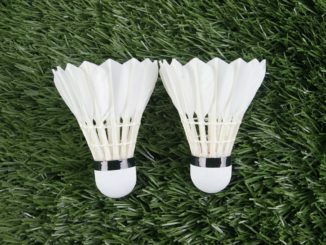 The manufacturers of Badminton shuttlecocks provide them in various speed units. The range usuallly goes from 75 up to 79 – Yonex is the exception. They indicate shuttle speed from 1 up to 5. This is necessary, because feather shuttles react to their environment – the temperature and altitude. In very warm regions far above sea level shuttlecocks will fly very far. This means you`d have to choose a very slow shuttle, if you don`t want it to fly long of the backline all the time. So you`d go for 75. As opposed to very cold regions below sea level, where shuttles will fly considerably less good and you would need a speedy shuttle. Then you`d pick 79. In a country with mild climate on sea level you would choose the medium shuttle speed of 77. A high air density however will provide resistance to the shuttlecock, making it harder for it to fly far. This is why altitude plays a role in Badminton shuttle speed as well. Regions with a high altitude have less air density than areas near sea level. If you take this into account as well, the slowest conditions would be a cold region below sea level. That`s where you need a very quick shuttle. In very warm, high-lying countries you have very fast conditions, making it necessary to choose a slow shuttle. Before using a shuttle there is a way of checking, whether the shuttle has the appropriate speed. It is called “Tipping the shuttle” – method. You go to the backline of the court and stand with your left foot right behind the baseline and perform an underhand clear to the far side of the court with full power. The shuttle should land in an area of 50cm before or after the backcourt service line. If it doesn`t land within this range, you should manipulate the shuttle. Usually, shuttles will be too fast and land further in the backcourt. In this case you have to fold the tip of some feathers outwards. Start by folding every fourth feather. If it is still to quick, fold every second feather. If a shuttle is too slow, you could fold the feather tips inwards. But I have actually never done that or even seen it done. The price for Badminton shuttlecocks varies hugely. This is first of all a matter of plastic or goose feather shuttlecocks. Plastic shuttles usually come in tubes of 4-6 shuttles, while feather shuttles are pretty much always provided in tubes with 12 shuttles. The price for these actually was strongly influenced by the bird flu a few years ago. The result of this was a “goose shortage” and by the laws of the market an increase in prices for shuttlecocks followed the bird flu. But what can you do, a real Badminton players can`t live without goose feathers. Prices vary widely. For both plastic and feather birdies it`s starts at about 5 bucks and can go up to 50 bucks for the best Badminton birdies. In general I would say, for plastic it should be about 10$, while feather shuttles should be bought for 20 – 30$. 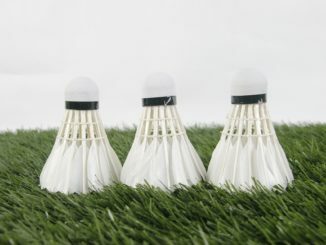 Shuttlecocks made from synthetic material like nylon or plastic are widely used for playing Badminton. They are quite cheap and a single plastic shuttle will hold for many, many matches without a scratch. So compared to the easy breaking feather shuttles, these are a good option for badminton beginners. Easily the best nylon shuttlecocks can be found in the Yonex portfolio. The best flight quality you will find in any plastic shuttle and I have not yet seen a more durable plastic birdie. If you are a badminton beginner or recreational player, the Mavis 2000 is your best choice. Feather shuttlecocks are usually taken only from left wings of a lving goose. So no animal harm here. Don`t ask me, why they only use the left wing. Must have something to do with aerodynamics. 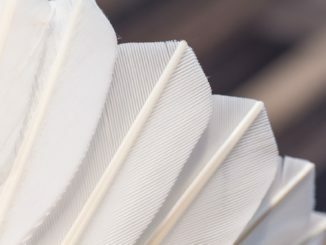 Feather shuttles require a good technique, because hitting them unclean, will very often result in breaking the feathers and therefore needing a new shuttle. This would become quite costly for beginners. But an intermediate or advanced player has no choice. Yo u have to go with feather and wouldn`t want it any other way despite higher costs. For goose feather shuttles, I can always recommend the Yonex Aerosensa Series. They are available in five different degrees of quality. The AS 10 is the cheapest shuttle of the series, but of course less durable than the others. 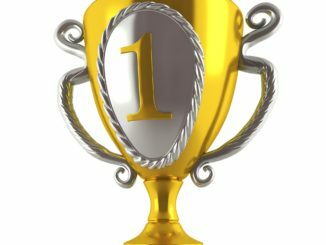 The following two suggestions should not be used for tournaments or leagues. They are available for very reasonable prices, but this of course also means, that these shuttles are simply not as good as the Yonex or Victor shuttlecocks. 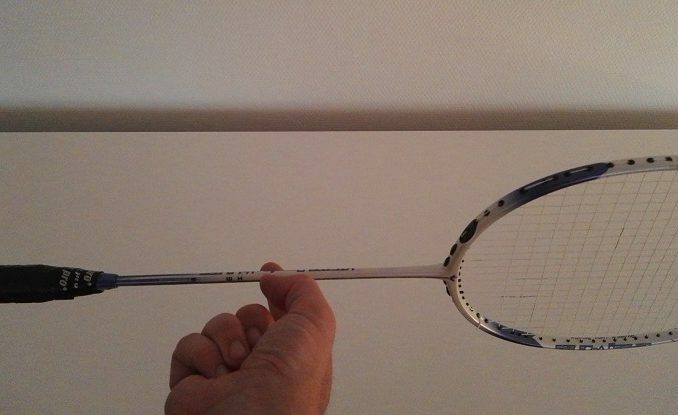 They break more easily and therefore are a good choice, if you spend lots of time on the Badminton court. Because if you play all the time, always using the most expensive shuttles, would strain your bank account very much. So Kevenz and Zhenan are a fair alternative. For this one, I have to go with Yonex once again. For about 10 bucks you get some very decent low-priced nylon shuttles. If you play Badminton for recreation, these are more than enough. The number one Badminton brand Yonex provides the best goose feather shuttlecocks, hands down. The Yonex Aerosensa 50 is THE high-grade shuttle with excellent flight qualities and great durability. A shuttle that is used for professional tournaments. Of course the AS 50 is not exactly cheap. Two tips, if you don`t want to go as high as AS 50. Victor and Senston provide shuttlecocks for very reasonable prices with a good feeling and durability. Great for intermediate players, that play in Badminton leagues and tournaments on a non-professional level. As a general rule you can say, that Badminton shuttles should not be stored for more than 6-12 months. If this value is leaning more towards 6 or 12 mostly depends on the brand, the quality and of course where the shuttle tubes are stored. So to be on the safe side, just use them for playing within a few months. However I can certainly see why badminton clubs would prefer to order large batches of shuttlecocks and store them over a long time. This would of course be a matter of the shuttlecock price. Ordering a huge amount of tubes will usually be heavily discounted. And given the fact, that goose feather shuttlecocks are not exactly cheap, this is certainly tempting. When storing shuttles, it is important to stand the tube upright with the cork downwards. Don`t just lay the shuttle on the ground! Store in modestly cold and slightly damp places! As a beginner or recreational player you can go for plastic / nylon shuttlecocks. An intermediate should definiteley use feather shuttles because they simply have much better flight qualities. It just feels better! Additionally, since plastic birdies are harder to accelerate, players tend to “overhit”. Which means hit harder than they should and strain their bodies by doing so. This can cause injuries, especially the shoulder and arms / wrists are endangered. So this is a small guide about the Badminton balls. Hope it helps. If you have questions, just leave a comment!